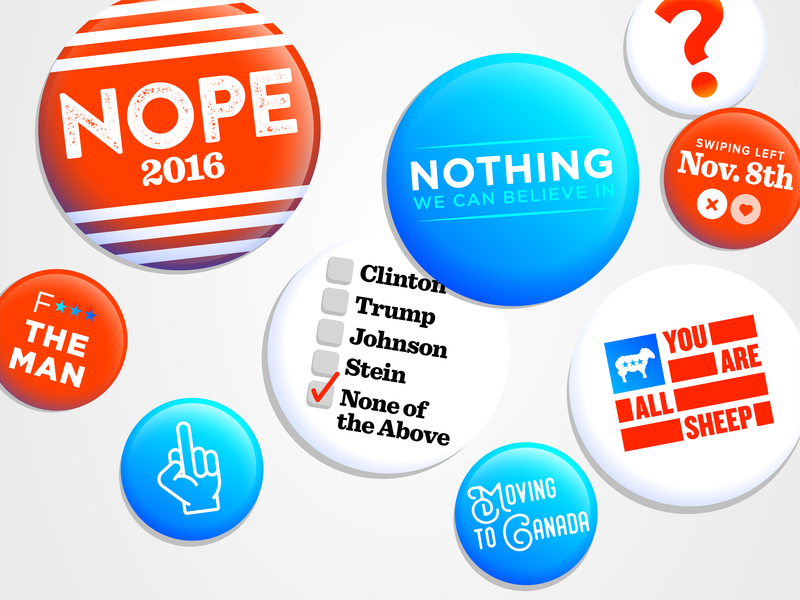 This is the fourth post in a multipart series on political branding in 2016. Click here to read part one, part two and part three. After a gauntlet of debates, caucuses and delegate math, the two leading contenders for US president have emerged: Hillary Clinton and Donald Trump. Let me guess: you’re not in love. Well, you’re not alone. Both Clinton and Trump ran winning campaigns, earning the nominations from their respective parties, yet together hold the highest unfavorable ratings in 70 years. How is it that the two strongest brands in the race are leaving so many people feeling disconnected and unsatisfied? Here’s the problem, and it’s a big one: the number of people who refuse to identify with either political party is dramatically growing. According to the Pew Research Center, today’s number of independents is at its highest percentage (39%) in over 75 years of polling, surpassing the number of self-identified Democrats (32%) and Republicans (23%). Brand loyalty in this category is quite simply evaporating into thin air. Beyond having the best logo, or even the best policy ideas, winning is fundamentally about connecting to people in a powerful way. This works especially well in primary season, when a candidate is appealing fervently to their brand’s most-loyal supporters to become their party’s nominee. The candidate loves their party, their party loves them and then they all throw an actual party in celebration! But the key to long-term loyalty is for candidates to nurture and cultivate their brand over time to be foundationally aligned with shifts in human desires. They need to understand what motivates the people experiencing their brand, who those people aspire to be and what really keeps them up at night. A continuous, strong empathy for the human condition makes everyone who comes in contact with the person or brand feel understood and fulfilled with purpose. They’re more likely to not only fall in love but also have loyalty to the brand over time. In the United States, there is a wide range of divergent opinions and needs—but it is dependent on a two-party system. Ultimately, this sets up the US electorate for discontent because there isn’t one solution that will solve everyone’s problems. Mass appeal is also especially difficult if a brand has been around for 40 years, like Hillary Clinton and Donald Trump. It’s hard to steer the ship into relevancy if the brand hasn’t sufficiently evolved. Functionally speaking, someone has to win. The United States needs a president. Think of it like cable providers: you might not be head over heels in love with any certain brand you see in market, but you still need cable to watch your favorite television shows. Your overall discontent can live for a while, but eventually a challenger that forges meaningful bonds with mass appeal will disrupt the category and WIN BIG (like Netflix). In the political sector, that challenger could be the next president. There is a big opportunity to build brands and elect candidates that goes beyond identity politics as usual, which focuses on the desires of just one party. Although it’s important for a candidate to satisfy his or her core support base, the real winners appeal in a more universal fashion, by providing experiences that promise and deliver empathy with transparency and integrity. Purpose-driven brands are compelling because they give people something larger than themselves to understand and believe in. It’s something authentic and true, with the promise of a better tomorrow. Meredith Post is a design director at LPK and a proud (and loud) Green Bay Packers owner. She brings extraordinary creative ideas and a steadfast promise to bettering her work and clients every day. You can mostly find her spreading the good word of Kanye West or sharpening her opinion as a political junkie. You won’t find a selfie of Meredith, but if you’d like to chat, follow her at @meredithwhitney or email her at meredith.post@lpk.com.